Tough played 25 games for Carlton after debuting in Season 1902. He kicked 2 goals in his time at the Blues. The Brunswick born Tough, was recruited from Zeehan on Tasmania's rugged west coast. 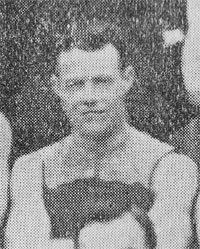 A player named Tough was named in the 29 man Carlton squad (20 played) for the game against St.Kilda on the Blues "home ground" of Victoria Park. Carlton's perennial problem of a lack of a permanent home ground, forced the Blues to use Collingwood's ground. If this is Charlie and had he played, then he would been 15 years 139 days. Match details of this game, have not yet surfaced. The Healesville and Yarra Glen Guardian. Last Sunday (10 Aug) the South Australian and Victorian players and officials visted Healesville. "The outing was much enjoyed by the visitors among whom was C. Tough (a former player for Healesville), but now one of the most prominent players of the Carlton Club." Contributors to this page: molsey , Bombasheldon , blueycarlton , tmd1 , Jarusa and admin . Page last modified on Wednesday 11 of July, 2012 16:22:16 AEST by molsey. 1990 Rd 13 - Wayne Johnston goes onto his trusty left foot. 2009 - They're Coming (Murphy, Gibbs & Kreuzer) page 1 of 2.